Dassault Systemes, the 3D Experience Company, provides business and people with virtual universes to imagine sustainable innovations. Its world-leading 3D design software, 3D Digital Mock-Up and Product Lifecycle Management (PLM) solutions transform the way products are designed, produced, and supported. Dassault Systemes’ collaborative solutions foster social innovation, expanding possibilities for the virtual world to improve the real world. The group brings value to over 150,000 customers of all sizes, in all industries around the globe. 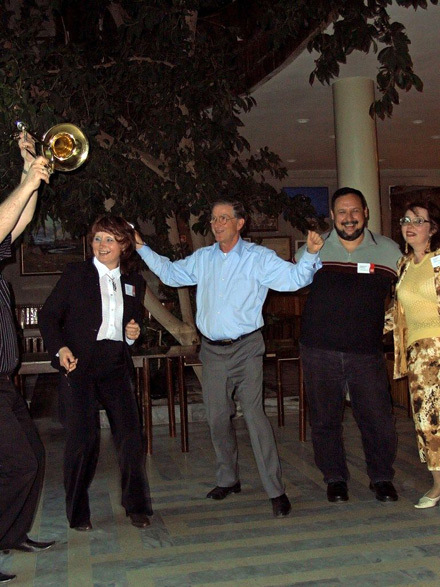 On June 22, 1999 LEDAS Ltd. and Dassault Systemes (DS) signed a Cooperation Agreement based on the previous three years of cooperation history between DS and the Russian Research Institute of Artificial Intelligence. During all 12 years of cooperation between two companies, the works were organized as a series of continuous contracts (supplements and later statements of works, SOWs)– without any gaps. In the first period, the contracts were aimed at integrating the LEDAS solutions into CATIA Version 5 software. 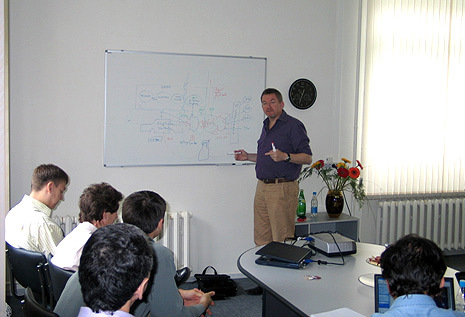 The supplements included development and maintenance of a powerful mathematical constraint solver, implementing end-user solutions based on this solver, extension of the user shells functionality according to the needs of DS customers, and research projects intended to prepare future constraint-based industrial solutions. Since 1999, in the framework of the Cooperation Agreement, 11 contracts have been successfully fulfilled. One of the solutions developed by LEDAS for CATIA Version 5 was issued with V5R8 release of the system and integrated into CATIA Knowledge Advisor — to enhance this CATIA product, which allows users to embed knowledge into designs and leverage it to maximize productivity of engineering decisions by design automation and reducing human errors. When designing a product with CATIA Version 5, a user comes across a system of mathematical equations to be solved. Whatever these equations (linear or not) are, CATIA provides user with a resolution method — a «SetOfEquations» capability accessed through the Knowledge Advisor workbench. It is based on original mathematical solver developed and maintained by the LEDAS programmers. Another end-user solution developed by LEDAS, called Constraint Satisfaction, was integrated into the CATIA Product Engineering Optimizer and issued with V5R10 release. Its key advantage is to solve not only pure mathematical functions, but also CATIA measures and other black-box functions for mathematical solver. Solving capabilities are provided with new constraint satisfaction algorithms — know-how developed by the LEDAS mathematicians. The second period (2003-2011), was completely devoted to the projects related to some kernel components of the new generation of the DS technology and substantially outsourced to LEDAS. These works are naturally NDA and could not so far be described. Some information however can be caught from the words of Francis Bernard, see below. Anyway, the LEDAS team will always be proud by its important and contribution to the building of products and solutions of one of the world leaders in CAD/PLM domain. The whole resource attracted by DS from LEDAS is estimated as 100 man-years. This cooperation gave to LEDAS team unique experience, enabled improvement of competence both in technologies and project organization and management. 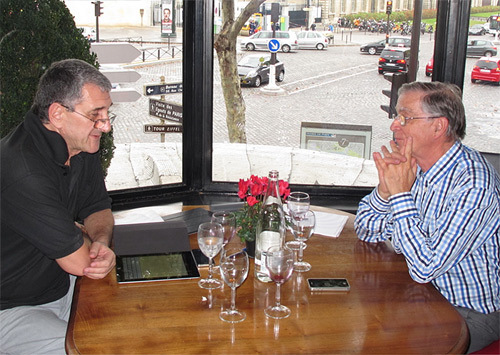 A lot of facts and comments about DS-LEDAS story can be found in History, future, and advantages of LEDAS (the company founder David Levin answers questions of a well-known blogger Deelip Menezes). During the years of cooperation, the LEDAS developers and managers have repeatedly visited DS for working and planning sessions. On the other hand, people from DS have multiply visited Novosibirsk for technical meetings as well as for conferences, seminars, and top management negotiations. LEDAS Ltd. combines high competence in software development, constraint programming, and mathematics. Since 1999, these skills have been applied within a Cooperation Agreement between Ledas and Dassault Systemes. LEDAS proved its capability to effectively perform a full cycle: from profound research to integration of the intelligent, high performance solutions into the CATIA releases, and then to - their reliable maintenance. Our continued cooperation with LEDAS always has the objective to deliver high value to our CATIA customers. The cooperation between DS and Ledas has been expanding steadily. The total value of our contracts has more than doubled over the last two years. Certain key components developed by Ledas have become part of CATIA V5 releases already or will be incorporated soon. Components developed by LEDAS in CATIA V5 are now on the market for several years, and have proved their reliability and performance in a full industrial context. Cooperation between DS and LEDAS has grown on new projects where high mathematical skill-team of LEDAS is a key success factor. As an example of a successful and mutually beneficial cooperation, I can mention the LEDAS Company from Novosibirsk. This team of brilliant mathematicians and professionals has been developing software for the geometric solver for CATIA (full statement). 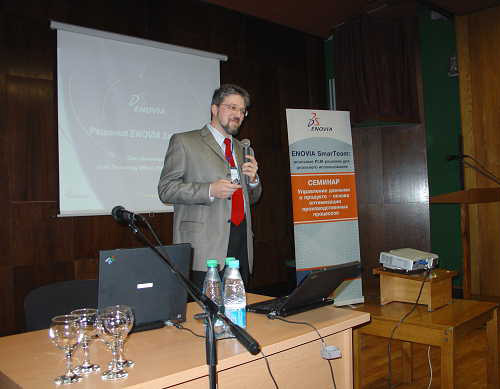 and participated in all PLM Forums that DSR held in Russia (2004-). Cooperation with DS gave LEDAS team a chance to meet and be closely acquainted with many outstanding and interesting persons. See below a part of related photo gallery. We are especially proud of our contacts with Francis BERNARD, the founder and first president of DS. 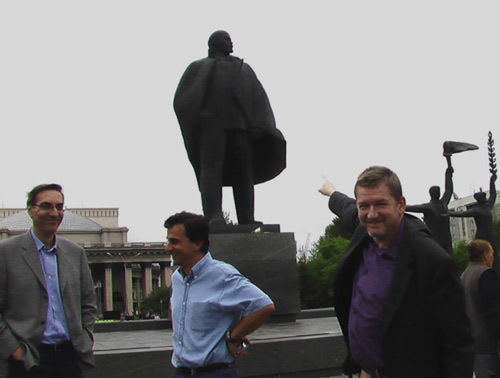 Francis several times visited Novosibirsk: as the first director of DS Russia and invited speaker to the isicad Forums organized by LEDAS. Since 2011, Francis is a member of the LEDAS advisory board.